Not to be confused with Albatross. An Albatoss is a red bird found in the game Super Mario Bros. 2. Their name is a portmanteau of the words "albatross," a bird, and "toss," which refers to their attack method. Albatosses used to be normal residents of Subcon until Wart took control. Albatosses carry Bob-Ombs and drop them on Mario and his allies. However, if an Albatoss flies low enough, Mario and his friends can jump on its back and ride on top of the bird. World 6-2 and World 7-1 require the player to ride on top of Albatosses to reach otherwise inaccessible parts of the level; these ones do not carry Bob-Ombs. Unlike most of the other enemies in Super Mario Bros. 2, Albatosses cannot be picked up and thrown. In the SNES and Game Boy Advance remakes of Super Mario Bros. 3, the King of The Sky is turned into an Albatoss (in the original version, he is turned into a generic vulture). 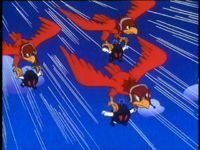 Three Albatosses carrying Bob-Ombs from The Super Mario Bros. Super Show! episode "The Bird! The Bird!" Albatosses make a few appearances in The Super Mario Bros. Super Show! They are usually used as bombers by King Koopa, and they sometimes capture Mario and company in nets. Albatosses are also seen in the show's intro. In the episode "Jungle Fever", Mario and his friends ride an Albatoss to get off of the bridge King Koopa sliced. Moon Man Koopa's spaceship also resembles the head of an Albatoss. Additionally, the character Hooded Robin somewhat resembles an Albatoss. An Albatoss is shown carrying Mario, Luigi, and Yoshi, but then hurls them into a wall. Albatiro Compound of albatros (albatross) and rosso (red). Compound of albatros (albatross) and tiro (throw). In Yume Kōjō: Doki Doki Panic, Albatosses move at two frames, while in Super Mario Bros. 2, they move at seven frames; an eighth frame exists, showing the wings moving back upwards, but due to a glitch is unused. Remakes of the game restore the missing frame. ↑ "He used to only be a resident in the world of dreams. Now, by order of Wart, he works as a carrier of Bob-Ombs." - Super Mario Bros. 2 instruction booklet, page 25 (Albatoss description). ↑ Yume Kōjō: Doki Doki Panic instruction booklet, page 33. This page was last edited on March 22, 2019, at 22:31.